The famous TV show set off yet another frenzy by devoting nearly an entire show to this amazing extract, calling it "The fat burner that works." Green coffee beans are rich in a compound called Chlorogenic Acid. Independent studies have found that chlorogenic acid boosts our metabolism by preventing the release of glucose into the blood stream1. Glucose is used by the body more immediately and this efficiency decreases glucose absorption. An increase in the metabolism of stored fat reserves is a by product of this reduced glucose availability. In time this results in decreased body fat and mass2. The manufacturers of GC50™ scour the planet looking for green coffee bean extracts with the highest concentrations of chlorogenic acid. They blend these super-strains into a formula that's guaranteed to have a minimum of 50% - and usually more. It's then 3rd party tested to confirm that strength. This means this product is stronger than those "name brands." Plus, it's one of the few that specifically offer a low caffeine content with less than 5% (when tested, it was actually closer to 2%, even better than the label claim!). Even more importantly, it's one of the very few product we've found that sticks to the recommended dosing: one capsule 3x per day 20 minutes before meals. Always check with your doctor before beginning any nutritional supplement. 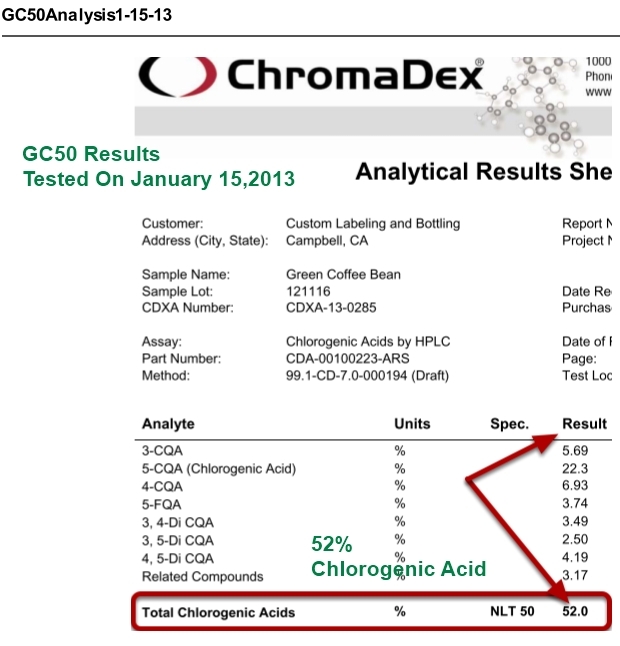 You can be confident that this is a higher quality, better value green coffee product. We settle for nothing less! 1Diabetes Care. 2009 Jun;32(6):1023-5. doi: 10.2337/dc09-0207. Epub 2009 Mar 26. Acute effects of decaffeinated coffee and the major coffee components chlorogenic acid and trigonelline on glucose tolerance. van Dijk AE, Olthof MR, Meeuse JC, Seebus E, Heine RJ, van Dam RM. Source Department of Health Sciences, EMGO Institute for Health and Care Research, VU University Amsterdam, the Netherlands. 2J Int Med Res. 2007 Nov-Dec;35(6):900-8. The effect of chlorogenic acid enriched coffee on glucose absorption in healthy volunteers and its effect on body mass when used long-term in overweight and obese people.Thom E. Source ETC Research and Development, Oslo, Norway.